Plan ahead, stay on track, explore. Satellite & topo maps, trails, elevations, route planning and navigation. OFFLINE, with just one tap. 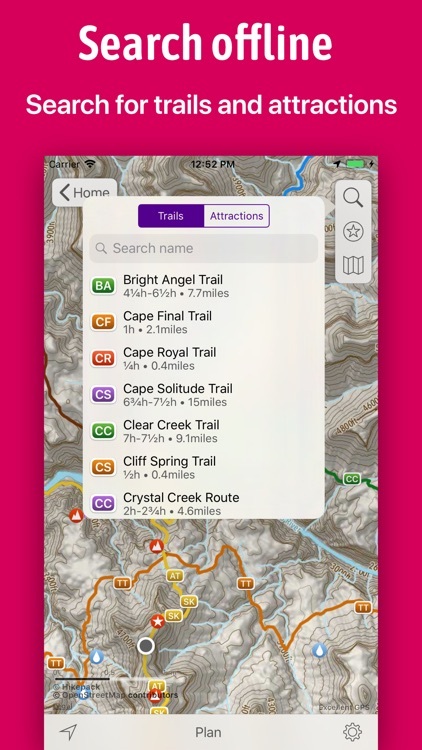 • Planning along trails: Plan your own custom route along existing map trails by simply dropping pins on the map. 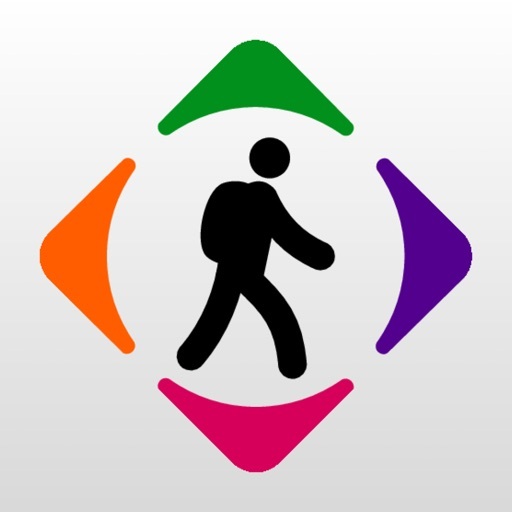 • GPS Navigation: Time, distance, elevation profiles, total ascent, descent, and calories. 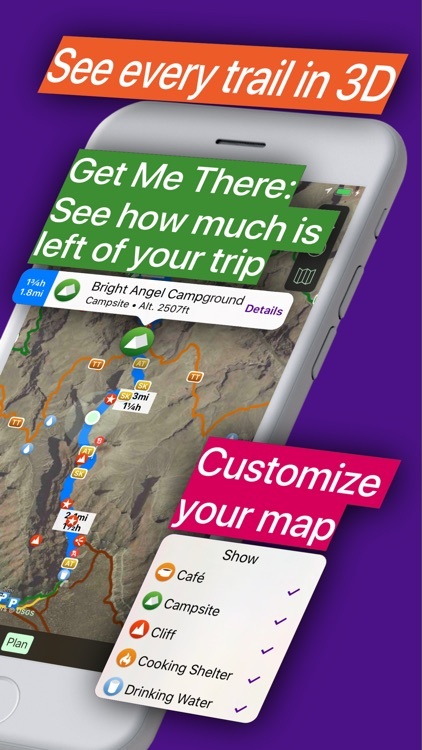 • Get Me There: While hiking, see the remaining time, distance and route to any map symbol or to any dropped pin. 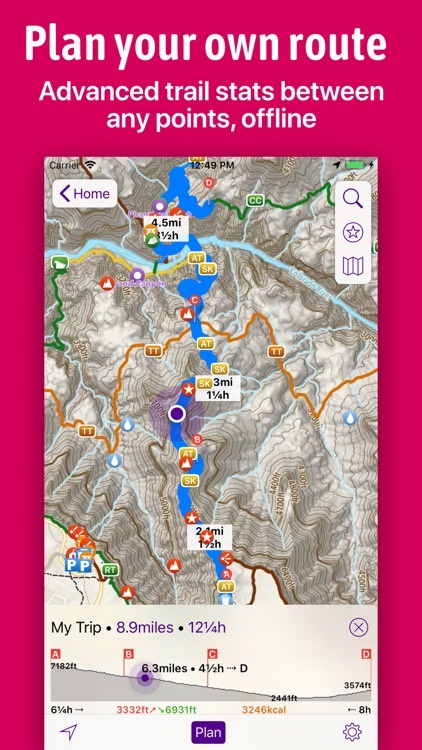 • Hikepack intelligently extracts all hiking, biking and cross-country ski trails and points of interest from OpenStreetMap data, and packs them into one download. 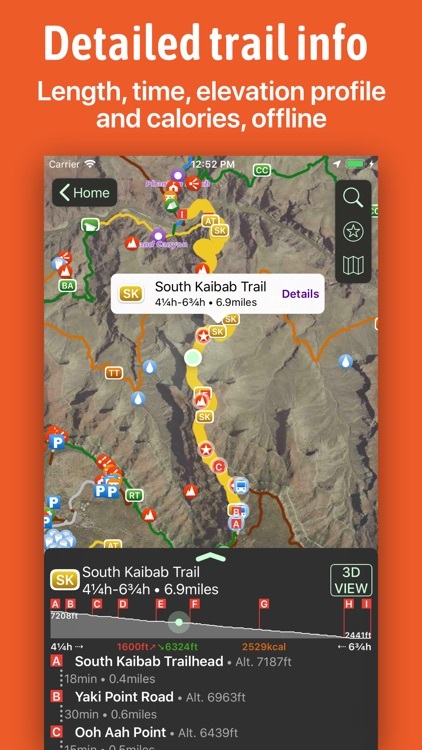 So you have a curated map focused on outdoor activities. 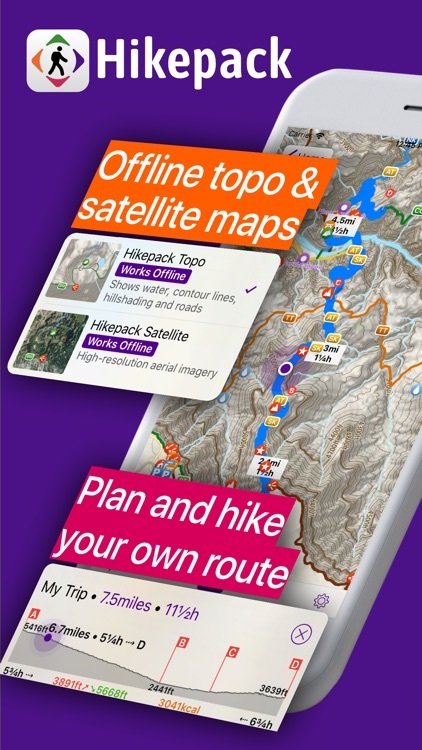 • The topographic and satellite map layers are created by Hikepack, from open data. * They cover the ENTIRE map, which means you're never lost. This is made possible by our proprietary compression algorithms, that allow for a small download and a smooth experience. 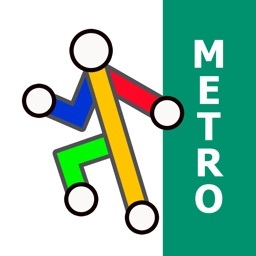 • All the routing is done on your device. So if you're in the middle of a hike and without cellular signal, you still see the remaining hiking time and distance to your destination. 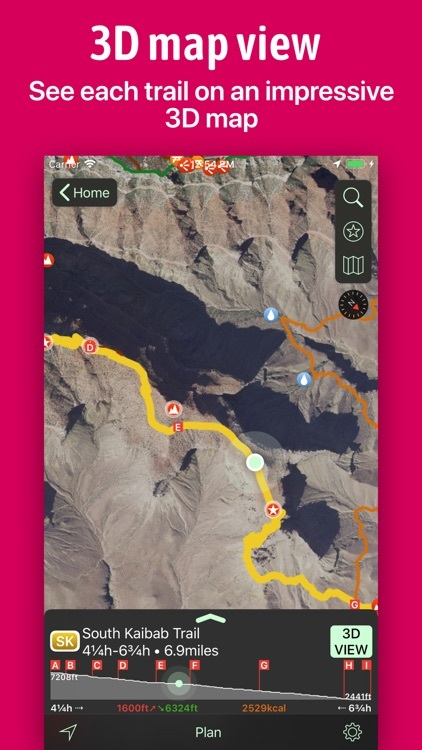 • You can save the routes you planned in one map, and then compare their elevation profiles at a glance. 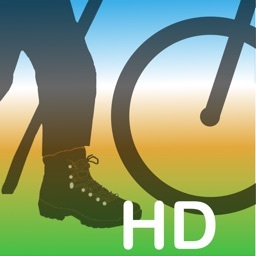 • You can change the hiking speed used for computing hiking time estimates. 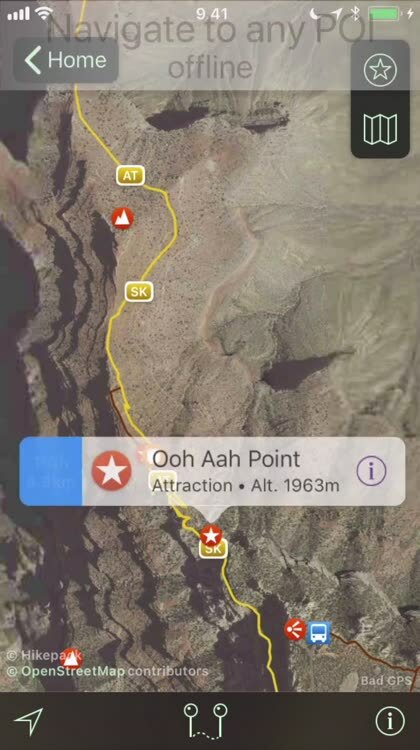 • You can filter what points of interest you see on the map. • You can measure distances in a straight line, between any points, but they will not take the terrain into account. 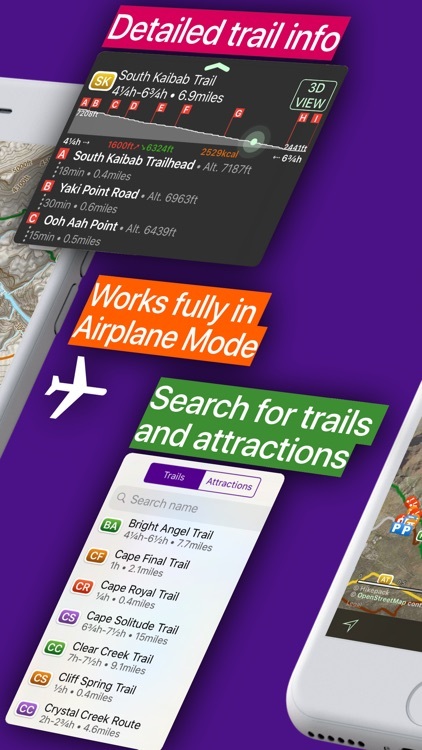 ••• You can download as many maps as you wish for free offline use, but some features require a Pro Pass subscription. We're just getting started, and we'd love to hear from you! Suggest new maps or features by sending an e-mail to [email protected], or using the Feedback form in the app. We regularly publish new maps in Hikepack. Currently, we cover all US national parks: Grand Canyon, Great Smoky, Yosemite, Zion, Rocky Mountain, Yellowstone, Olympic, Acadia, Grand Teton, Glacier, Joshua Tree, Cuyahoga Valley, Bryce Canyon, Hawai'i Volcanoes, Arches, Hot Springs, Shenandoah, Mount Rainier, Death Valley, Haleakala, Sequoia, Capitol Reef, Badlands, Everglades, Saguaro East, Saguaro West, Canyonlands, Crater Lake, Theodore Roosevelt, Petrified Forest, Wind Cave, Kings Canyon, Mammoth Cave, Mesa Verde, Redwood, Lassen Volcanic, Glacier Bay, Carlsbad Caverns, Virgin Islands, Great Sand Dunes, Big Bend, Channel Islands, Kenai Fjords, Voyageurs, Black Canyon of the Gunnison, Pinnacles, Guadalupe Mountains, Great Basin, Congaree, Katmai, North Cascades. We also cover 40 US national forests, and many other parks, all UK national parks, 35 maps in Finland covering the main hiking areas, from the northern-most parts of Lapland, to popular parks near Helsinki, and 37 maps in Romania covering most of the Carpathian mountains. 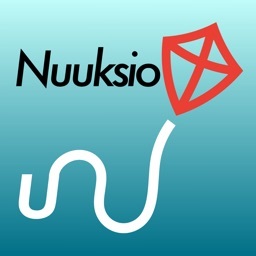 * Satellite imagery available only for selected maps in the US and Finland only. The topo layer available for all maps. 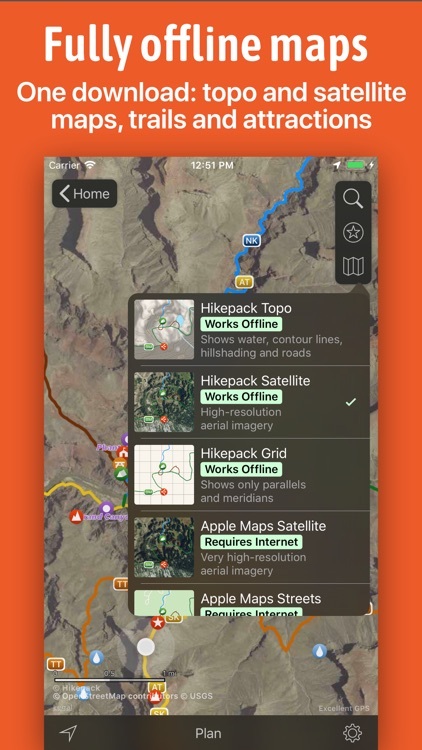 ** The maps are created by Hikepack from open data. See the details page of each map for the copyright holders.